A few years ago Michael Norton and his buddies wrote about “The Ikea Effect” which they describe this way: “When people construct products themselves, they come to overvalue their (often poorly made) creations.” This turns out to be an important finding for consultants. Norton’s gang studied their hypothesis using origami, which is not a product most people buy, but was undoubtedly easier for the researchers to haul around than pallets of build-it-yourself kitchens. Hmmm… people valuing their own amateurish work as highly as the work of experts. Notice a striking resemblance to some of your clients? When the Ikea Effect sprinkles fairy dust over a client’s own efforts, it can undermine the perceived value of our work. That’s doing us no favors. For clients to truly appreciate our contributions we have to outshine any competing, internal activities. Deliver a high-value, client experience. Involve clients in the construction of their experience. I listed the essential activities in an experience that creates customer delight, then realized that misses the point. Rather than telling you how to involve clients in the project experience, let’s build the list collaboratively. Below are some prompts to spark your thinking about the client experience. Post your thoughts and input and I’ll pull some of your suggestions into the body of the blog itself. What do your clients get within minutes of signing an agreement with you? What happens the day/week/month after a project is signed? How do you update your clients throughout the project? How do you step “outside” the project’s tasks to ensure your client is pleased? How do you involve you client in the development of your solutions? How do your clients participate in the creation of deliverables? Wm. David Levesque suggested that we think about our Net Promoter Score, and how the client experience will improve that. Mary Drotar wisely advised us to stay positive, and David Lee reminded us to ask good questions rather than rushing to answers. Both suggestions will definitely improve the customer experience. Mike Dalton shared his problem-solution-problem framework, which redirects attention back to the client. Pete Haglich flipped the entire idea on its head by reminding us that we need to be on the lookout for the Ikea effect in our own work. Good point, Pete! Then Ken Acer revealed how he involves his clients in building their own versions of the tools, templates and spreadsheets we all love to construct for our clients. Outstanding. 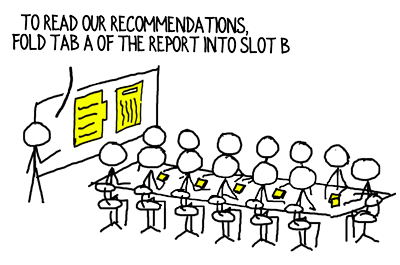 Your suggestions remind me of Net Promoter Score. While NPS is often used to measure the total experience “on a scale of 0-10 would you recommend us to a friend or colleague?” it can also be adapted to be used to evaluate and improve each touch point of the customer experience. What a shame it would be to provide outstanding value, only to diminish the experience because your client felt the communication was too little (or too much?) or the invoice too confusing to understand. It is not uncommon to focus on the main event (the awesome outcomes we create for our clients), yet we may fail to earn 9-10 on our Net Promoter Score with our clients (potentially missing the potential to harvest referrals repeat business or add-on business) due to misses within the total experience. We are often aware of the strongest link in our value creation chain – do we know our weak link and its ability to blindside our progress? Thank you for adding the NPS concept to the discussion. I’ve seen this before with processes that are built internally. Be careful and try to stay positive when it looks ridiculous. I think we are going to see more of this with smaller budgets. If anything don’t do work for free. People don’t value you or your work. Staying positive is a powerful piece of creating a…well… positive customer experience. That’s a good addition to the list, Mary. “There’s no value in free” can absolutely apply to consulting. I’m a long-time proponent of not giving away work. On the other hand, i have seen free assessments, diagnostics and introductory sessions all lead to substantial, paid work. My order of preference is: 1) high-fee work, 2) free, 3) low-fee work. Charging a tiny fee actually lowers the perceived value of your work more than free does. Thanks for raising both points, Mary. Don’t rush so fast to be the “Answer Guy/Gal” or demonstrate your vast wealth of knowledge, but instead focus more on asking good questions. Great suggestion, David. We have to fight the “Irony of Expertise” and learn to step back a bit. Thank you for adding that. This post raises more questions than answers for me. One of my challenges is that to avoid giving away work for free or at a lower cost, I give clients the option to handle certain parts of the project themselves with my guidance. So far, clients have realized that my input has made a material difference in the end product. Perhaps because I create milestones to understand the client’s point of view, provide feedback and hold the client accountable for deliverables. And together we assess their internal skill sets to see what they can truly handle themselves. Another issue is that in my field (Hispanic/Multicultural strategy consulting), success entails the client developing their own expertise through the process as it ensures the long-term sustainability of the effort. Perhaps the way to avoid the IKEA effect here entails ensuring that both the client and I can evaluate if the knowledge is being applied (our perception as well as tracking the change in outcomes). Finally, on some occasions my client will not heed my advice and do things themselves until they get egg in their face, then ask me to come in and rescue them a few months later. Is this bad for business? Excellent questions, Sandra. First, it sounds like you already take many steps to build the customer experience. You’re building solutions with clients, not handing solutions to them. A corollary of the Ikea Effect is 20/0 hindsight. As opposed to 20/20 hindsight, which is perfect vision of the past, with 20/0 hindsight clients see their own contributions but totally forget yours because your ideas were “obvious” (in retrospect). One way to improve the customer experience and avoid 20/0 hindsight is to wrap your ideas in a framework or metaphor. 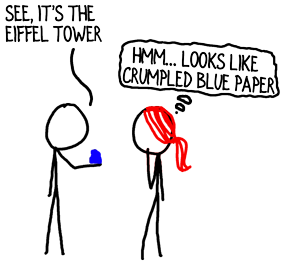 Finally, sometimes it’s best to let clients find out the hard way that their origami Eiffel Tower is actually a crumpled mess. In the long run, it’s better for business to work on projects perceived as highly successful, and projects work best when clients firmly believe they need you. David – I’ve learned to structure discussions as problem-solution-problem. Obviously you start by getting a deep understanding of the clients goals and reality before you talk about solutions. But after discussing general direction for a solution it’s important to also raise some of the challenges that implementing your solution has without the necessary tools and experience. You can put tab a in slot b yourself but be careful about c because you may never get yourself out of the box you have built. Doing this well is part of what I’ve heard you call creating want or desire not just for the solution but for your expertise in delivering the solution. Very well stated, Mike: “Create desire not just for the solution, but for your expertise in delivering the solution.” We create outstanding customer experience by planting our attention firmly on our clients, and that’s why I like the problem-solution-problem structure you suggest. It brings the focus back around to the client, where it should be.